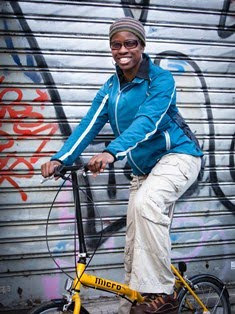 Whenever I'm in London on Christmas day I always do a bike ride around the city. It's probably my favourite day to ride a bike. I love travelling through this great city with hardly any traffic around, and seeing the sights and the architecture in their full glory, without needing to have too much added focus on the crazy traffic! Also, the Christmas lights and many folks out walking with their families just adds a feelgood factor to the atmosphere. For today, rail trails had to be put on hold as there are hardly any in London. There are disused underground stations, but that'll be for another day, and I think cycling underground might present some problems! Having said that, I did find lots of traffic-free places to ride, notably on the Regents Canal towpath. It's a lovely thoroughfare where you see the different architecture and degrees of stylishness as you go along. 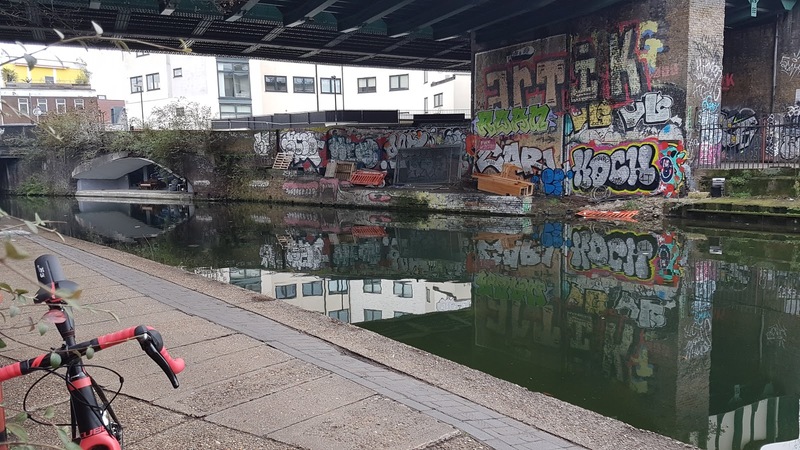 I joined the towpath at Mile End, over in East London, and continued past Hackney and Victoria Park (the people's park). These areas were quite industrial-looking with urban graffiti, with some parts looked a little bit run-down. I have to say, I like these scenes though because there is character in these places and there are always interesting stories to find out about the history of these places - something else to do for another day. Then as I got nearer to Islington the path became more stylish as I went past the backs of design studios, and hip cafes. I did leave the towpath at Islington to head North to Highgate and Hampstead, but rejoined it later on at Regents Park, where this section of the towpath had a regal feel, particularly as it passed near some of the most affluent parts of London like Primrose Hill and St John's Wood. 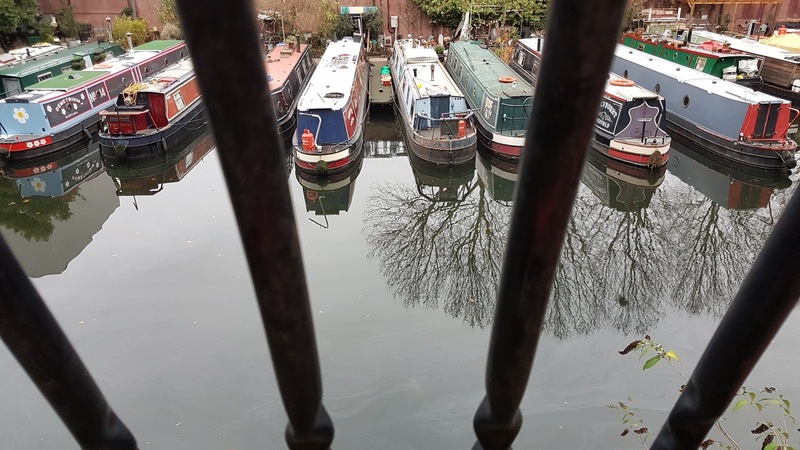 I finally left the canal at Little Venice, which must make for one of the most alternative addresses to have, for the folks who live on the boats moored there. 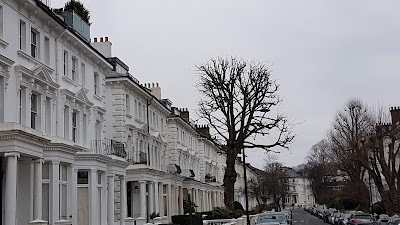 For this London loop I had considered riding all the way up to Alexandra Palace, but given the time constraints I just went as far as Highgate. Once again my ride included another pretty arduous hill - Highgate Hill. 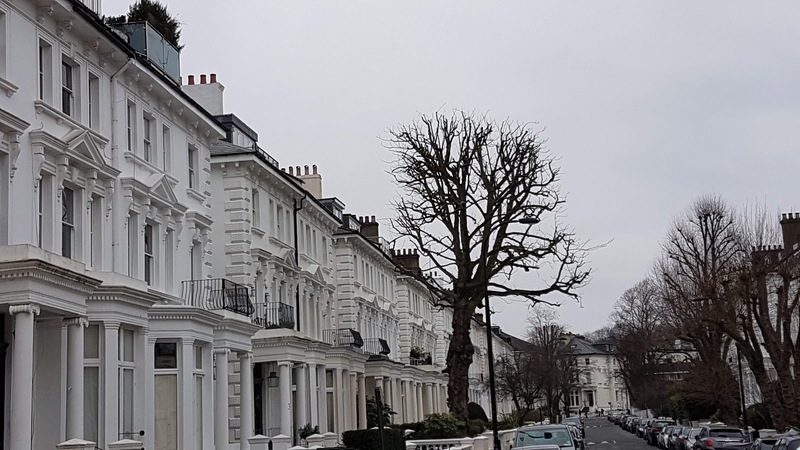 Living in Crystal Palace, I am no stranger to hills in London, and I always thought the that the steepest hills can be found in and around my neighbourhood. In fact, Highgate can't be discounted as having the steepest hills in London. This hill went on for about a kilometre and was a real grind. This should not have been a surprise to me as this hill runs parallel to Swain's Lane, a road I have competed on in the past for the Urban Hill climb. So therein was the clue that this road wouldn't be flat! Once the road levelled off I was able to "recover" by doing a stretch across Hampstead Heath. One of the great things about having the Cube Nuroad gravel bike is the freedom to get onto gravel trails at will, which is what I did on the heath. Even at times I completely off-pisted it by riding across the sodden grass. The tyres aren't specifically adapted for riding on wet or really muddy trails, but the Nuroad still coped over those short stretches - as it had done along the River Avon trail yesterday. After these capers I then made the homeward run via the sumptuous neighbourhoods of Belsize Park, Primrose Hill, and down through Chelsea to get home and enjoy some Christmas dinner. 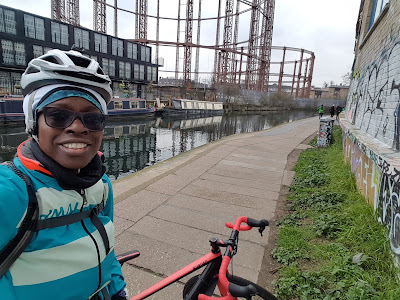 One really interesting find for me during this ride was the Waterlink Way - a traffic-free, tarmacked cycle route very close to where I live, that goes through Sydenham, Catford, and Lewisham, all the way to Greenwich. It is a very pleasant ride that basically follows the River Ravensbourne. I almost feel ashamed that I didn't know about this route earlier. It is a much more pleasant way to get to Lewisham than on the road route, and I would highly recommend it. I guess that's the thing about a Christmas ride in London - it is the chance to discover new places and new routes that I generally feel too much in a rush to bother looking for during my busy schedule at other times of the year.